A Sept. 14 attack on the U.S. embassy in Tunis left 4 dead, 49 injured, several buildings looted and burnt out, and the black Salafi flag flying above the embassy grounds. In response, the ruling "moderate" Islamist party of Tunisia, Ennahda, forthrightly condemned the incident; Minister of the Interior Ali Larayedh recognized that the government "failed to protect the embassy and we should offer our apologies to the Americans." Ennahda's leader, Rachid Ghannouchi, more vehemently condemned the Salafis as a "danger" to freedom and security in Tunisia and called on a fight against them through every legal means. 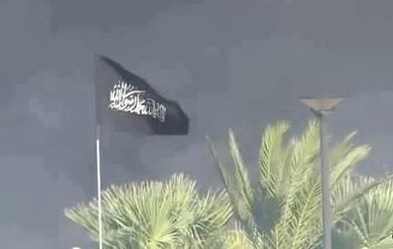 The Salafi black flag flew over the U.S. embassy in Tunis on Sept. 14. These statements reassured Americans that if long-bearded and burqa'ed crazies want to kill them, moderate-sounding Islamists in ties and hijabs are civilized, law-abiding allies. That in turn fits a policy going back to 1992 of fighting violent Islamists while cooperating with non-violent ones. Thus did American troops execute Osama bin Laden while American presidents helped Islamists reach power in Turkey and in Egypt. Many other differences mark variant strands of Islamism: Yusuf al-Qaradawi urges conversion to win over non-Muslims, Nigeria's Boko Haram prefers to kill them. The Hizb ut-Tahrir organization aims to bring all Muslims under the rule of a universal caliphate, Turkey's Fethullahis aspire to build a national form of Islam. Egypt's Islamist president routinely wears a tie, his Iranian counterpart never does. The former Cat Stevens sings a cappella nasheeds, while Somalia's Shabab ban all music on the radio. Women may not operate a car in Saudi Arabia but they drive taxis in Iran. Ali Larayedh, Tunisian minister of the interior and tie-wearing "moderate" Islamist. Broadly speaking, Islamists divide into three types: (1) Salafis, who revere the era of the salaf (the first three generations of Muslims) and aim to revive it by wearing Arabian clothing, adopting antique customs, and assuming a medieval mindset that leads to religious-based violence. (2) Muslim Brothers and like types who aspire to an Islamic version of modernity; depending on circumstances, they might act violently or not. (3) Lawful Islamists who work within the system, engaging in political, media, legal, and educational activities; by definition, they do not engage in violence. 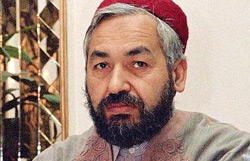 Ennahda leader Rachid Ghannouchi, caught on video. Their differences are real. But they are also secondary, for all Islamists pull in the same direction, toward the full and severe application of Islamic law (the Shari'a), and they often cooperate toward this end, sometimes covertly. For example, a recently leaked video from Tunisia spectacularly links Ennahda to the embassy violence. Initially broadcast in April 2012, the video resurfaced on October 9. In it, Ghannouchi talks tactics with young Salafis to achieve their common goals and boasts, "We've met with … the Salafis, including Sheikh Abou Iyadh." Oh really? Abou Iyadh, whose real name is Seifallah Ben Hassine, heads Ansar al-Sharia, a.k.a. Al-Qaeda in the Arabian Peninsula. Tunisian police established a dragnet to question him about his role leading to the Sept. 14 attack. With the revelation of this meeting, the video undercuts Ennahda's condemnation of the Sept. 14 attack. Seifallah Ben Hassine, a.k.a. Abou Iyadh, the leader of Ansar al-Sharia. The video also shows that Ghannouchi sees Ennahda and the Salafis as allies in the effort to dominate Tunisia and implement Shari'a. He offers his Salafi listeners some strategic advice: "I tell our young Salafis to be patient ... Why hurry? Take your time to consolidate what you have gained" by creating "television channels, radio stations, schools and universities." He also admonishes them to "fill the country with associations, establish Koranic schools everywhere, and invite religious preachers." Revealingly, Ghannouchi states that "The government is now in the hands of Islamists, the mosques are ours now, and we've become the most important entity in the country." Note the references to "ours" and "we," further confirming that he sees Ennahda and the Salafis constituting a joint force. Ghannouchi's reaching out to Al-Qaeda fits a larger pattern. The Turkish government not only works with, IHH, an organization associated with Al-Qaeda, but it may soon join North Korea and Iran on the black list for its lax terrorism financing laws. The Council on American-Islamic Relations appears legitimate but is a terrorist-supporting front organization founded by Hamas supporters. 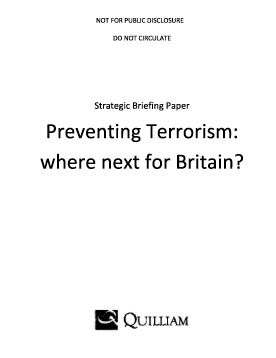 "Moderate" British Islamists exploited terrorist incidents to increase their clout. The Tunisian tape brings yet another carefully crafted bifurcation of moderate and extremist Islamists crashing down. All Islamists are one. 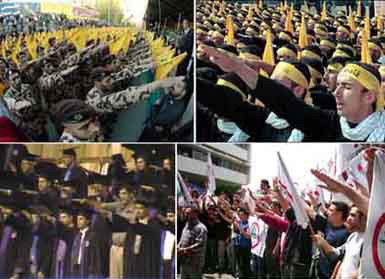 A moderate Islamist is as fantastical a notion as a moderate Nazi. Every member of this barbaric movement is a potential totalitarian thug. Western governments should neither accept nor work with the one or the other. "A moderate Islamist is as fantastical as a moderate Nazi." Oct. 30, 2012 addenda: (1) I lacked space to discuss the alarming news that the Tunisian government allows two jihadi camps to operate on its soil: for more details see "Tunisie: qui protège les camps jihadistes?" by Malik Aït-Aoudia in Marianne, a French magazine. The list sent to the OSCT includes a unit within Scotland Yard called the Muslim Contact Unit and another independent group designed to improve the relationship between the police and the Muslim community called the Muslim Safety Forum. It also includes the Muslim Council of Britain, one of the main groups representing Muslims in Britain, and its rival the Muslim Association of Britain. Other groups on the list are the Islamic Human Rights Commission, the Federation of Student Islamic Societies and the Cordoba Foundation. Quilliam also singles out the Islam Channel, a satellite TV channel which has been the subject of one of their reports. Among the mosques identified are Finsbury Park mosque in North London, formerly run by the extremist preacher Abu Hamza but now under new management, along with East London Mosque and Birmingham Central mosque. Politicians described as "Islamist backed" include Salma Yaqoob, leader of the Respect Party, and the former Respect MP George Galloway. Feb. 10, 2013 update: In an interview with the BBC, Ghannouchi tried to wiggle out of his earlier statement by claiming that "Salafists are not one group. There are those who promote violence and those who denounce it and there are those with whom the government of Ennahda has had confrontations." Ghannouchi slices up Islamists into thin tranches; I say that, in the end, they are all the same. On March 26, Ali Larayedh (who moved up from minister of the interior to prime minister) used an interview in the French newspaper Le Monde to accuse Abu Iyad, who has ties to Al-Qaeda, of being "deeply involved in issues of violence and arms trafficking." He also spoke of a Salafi faction "that advocates violence and terrorism. There is no dialogue with those who are at war with society." To which Abu Iyad replied with threats: "Keep your sick ones from us, or we will direct our war against them until their downfall and their meeting with the dustbin of history. ... Know that we will not delay in saying that the answer is what you see, not what you hear. ... If you do not rectify your situation." A significant number of Ansar al Sharia Tunisia members were detained after the Sept. 14 assault on the US embassy in Tunis. Salafists were again detained after the assassination of Chokri Belaid, a popular leftist politician, on Feb. 6. It was after Belaid's murder, which rocked Tunisian society, that Larayedh succeeded Hamadi Jebali as prime minister. During his Le Monde interview, Larayedh said that some "accomplices" of Belaid's murderer have been arrested, and that Tunisian authorities have identified the chief suspect, who remains at-large, as "a man in his thirties." Belaid's assassin "is part of the Salafst movement," Larayedh explained, and "he attends their cultural events and mosques." 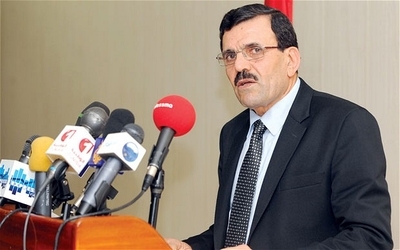 Larayedh hinted at the possibility of a deeper conspiracy behind Belaid's death. "But have these men acted alone or on behalf of a group [that is] internal or external to Tunisia?" Larayedh asked rhetorically. "This is what we are now trying to determine." "Where are the many weapons seized in recent months in Tunisia?" Le Monde asked. "Since several months ago, the Ministry of Interior has been working on weapons trafficking networks," Larayedh answered. "Violent groups have wanted to benefit from them and have stored these weapons with the idea of using them one day in Tunisia or elsewhere." Larayedh then offered a potentially ominous observation: "For the moment, there are more weapons seizures than armed actions." It is particularly interesting, given this context, that he accused Abu Iyad of being involved in "arms trafficking." During an interview aired on Tunisian radio, Gen. Carter Ham, the chief of US Africa Command, said that "it is very clear to me that al Qaeda intends to establish a presence in Tunisia." However, Ham added, the Ennahda government is "committed to doing everything it can to prevent al Qaeda from establishing a presence." Abu Iyad's Ansar al Sharia Tunisia took note of Ham's comments. In a Facebook posting several hours after the release of Abu Iyad's letter to Ennahda, the group posted a picture of Ham with a caption claiming there will soon be a "US intervention on the pretext of combating terrorism under the auspices of the puppet government." The "puppet government" is, of course, Larayedh's Ennahda-led coalition. Comment: At this point, Rachid Ghannouchi's attempt to coordinate Ennahda and the Salafis appears to be failing, with the Salafis out of control.Intentions do not always succeed. Some of global jihad's most notorious leaders are operating relatively openly in Tunisia, a dilemma for the North African nation's Islamist government after it pinned the assassination of an opposition leader on Islamist militants. A weak government since the collapse of President Zine al-Abidine Ben Ali's secular dictatorship in early 2011 has helped turn Tunisia into an Islamist militant haven in North Africa, say Western diplomats and defense officials in Tunisia. The moderate Islamist-led coalition elected to succeed Mr. Ben Ali has been slow to rein in radical Islamists, these people say. 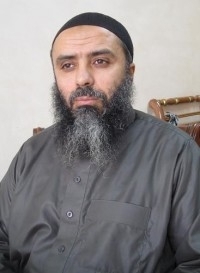 Among the veterans of global jihad now operating relatively openly in Tunisia is Seifallah ben Hassine, the head of Ansar al-Shariah, which Tunisian and Western officials have identified as the country's most worrisome militant group. Another veteran jihadist, Sami Ben Khemais Essid, has been photographed alongside Mr. Hassine at recent rallies in Tunisia. Such figures, which have strong ties to al Qaeda's North African spinoff, al Qaeda in the Maghreb, or AQIM, see the country as ideal to lay low, stockpile arms and muster new recruits. Tunisia sits at the crossroads between Libya—rich with weapons and open territory where they have set up training camps—and Algeria, AQIM's birthplace. And many more details follow. June 3, 2013 update: Comes news (in an Islamist Watch-sponsored article by Andrew Harrod ) of Turkish cooperation that parallels the Tunisian one documented above, between the supposedly moderate government and some fiery Salafis. In this case, it's Suat Kiliç, Minister for Youth and Sport of the AKP-dominated government, who met with the leadership of the German-based Die Wahre Religion. June 6, 2013 update: Mark Durie provides an excellent guide to understanding the distinction between (1) and (2) above, the Salafis and the Muslim Brothers, at "Salafis and the Muslim Brotherhood: What is the difference?"